Since I have moved to a new place I am finding that my design sense is changing just a bit. I’m very, very inspired by the beach. Never have I really had the chance to go to beaches unless they were man made on an Oklahoma lake which is fun, but completely different. But now I am only 30 minutes from a world class beach and it’s amazing. I’ve learned that I love bay fishing and even though when the saltwater gets in my mouth when swimming makes me gag, I still really love flapping around in the waves. I’m also finding myself inspired by the culture. Here in Brownsville, TX the population is over 93% Hispanic. As such I’ve gotten kind of a crash course in Hispanic culture. I’m slowly learning the language, my tolerance for spicy food is growing and I’m finding myself even more drawn to color than I already had been. The pace of this area is also incredibly different and I think very, very good for me. Things here are slower than they are in other places. You’ll often drive down the highway and pass a ton of cars because they aren’t in a hurry. For the most part the people are quite laid back. I truly feel like this is helping me to slow down and appreciate things a bit more. I’ve loved sugar skulls for a while and my sister for ages and ages. 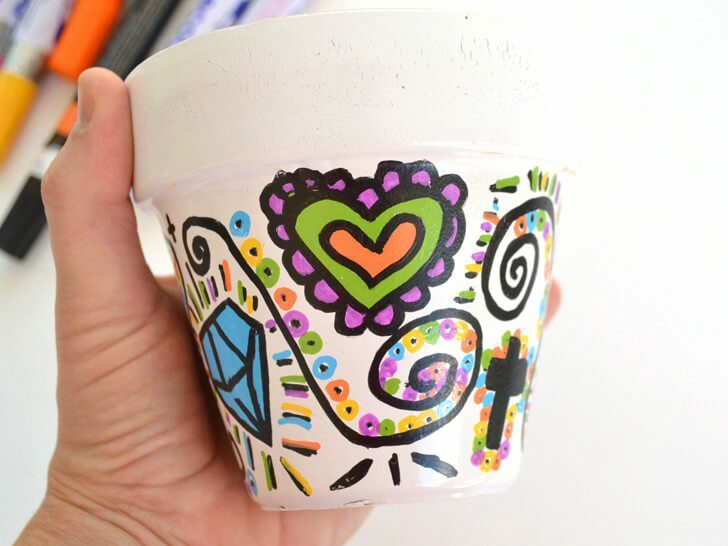 My new colorful life has inspired me in so many ways including my recent craft passion. 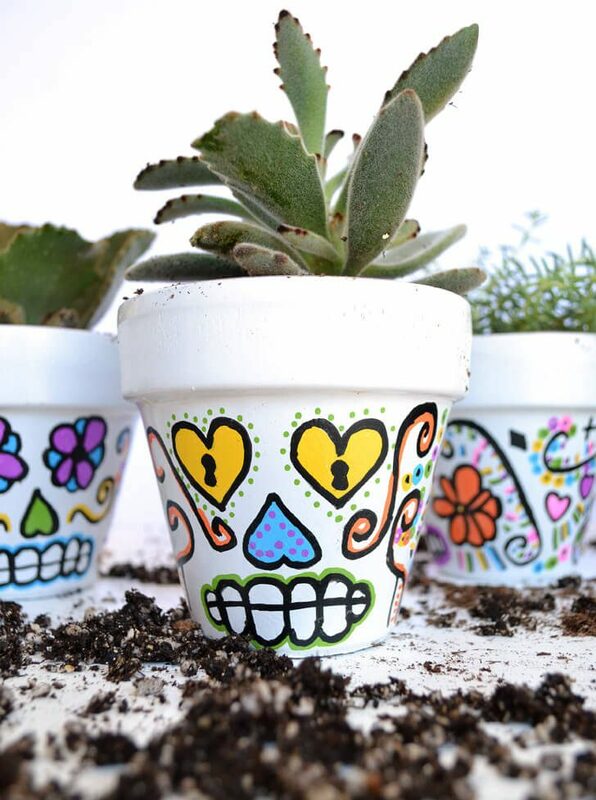 So today I’m sharing with you a way to plant your succulents in a colorful and fun way. So grab those brightly colored paints and let’s get on it, shall we? 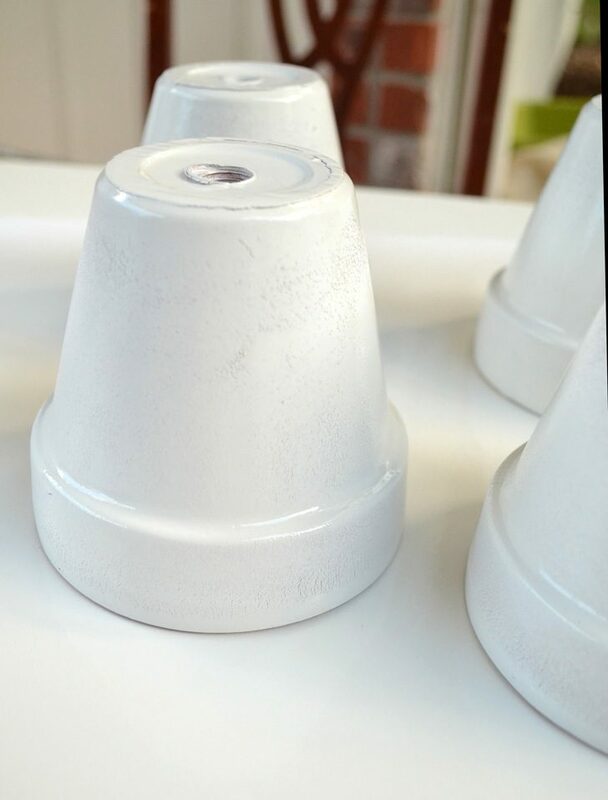 I first started this project using some cheapie white glossy spray paint and I have to tell you, that was a mistake! My very first partial pass I watched the paint get sucked right up into the clay. The color only changed to look slightly foggy. I realized that I was going to need a whole lot of cheap paint to rock this out so I stopped and ran out for the good stuff (Rustoleum 2X Ultra Cover with primer inside) and only had to go 2 rounds with the paint. 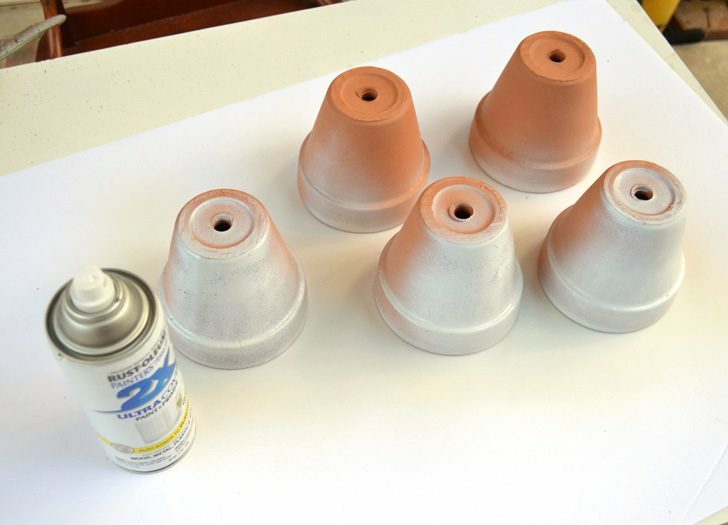 Spray your pots and allow to fully dry. Overnight is fab but a few hours will do if you’re in a hurry. 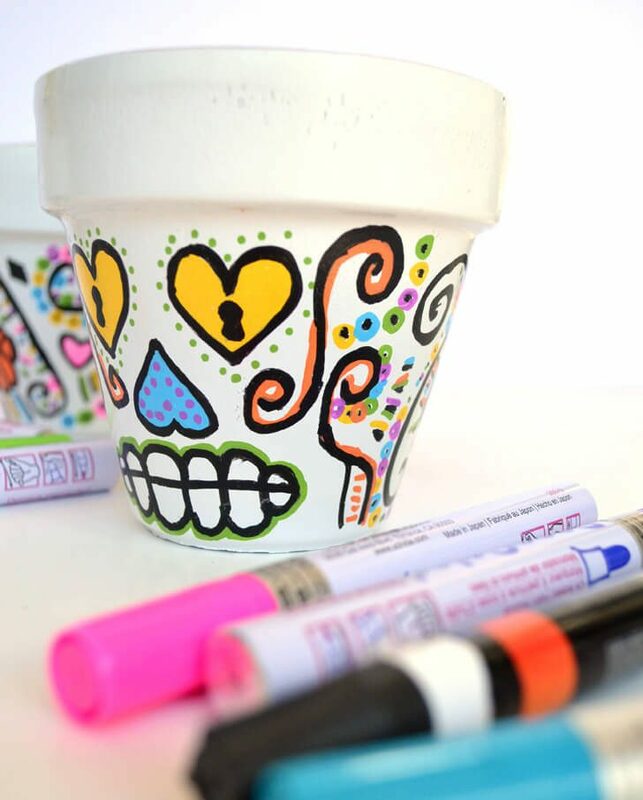 Grab your black paint marker and start to draw the shapes of a sugar skull. 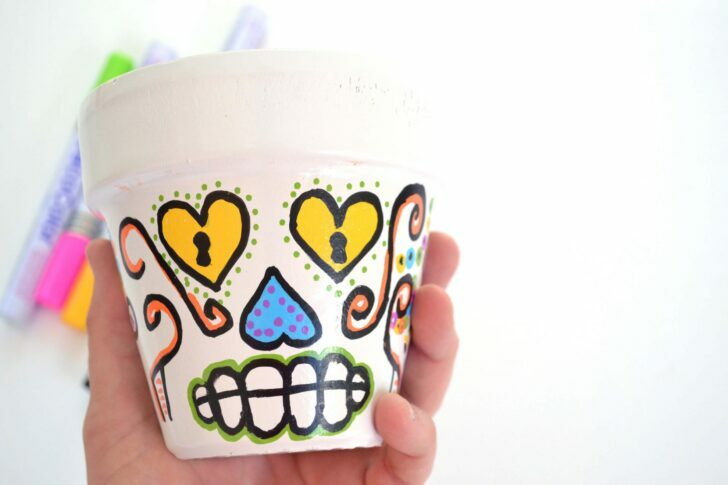 You can do a Google image search for sugar skull inspiration to help you out. You can make the eyes out of flowers or hearts and embellished circles among other things. An upside down heart makes the perfect nose. To easily draw teeth make lines and then connect them top and bottom with a semi-circle to make the teeth. Draw down the center to divide into upper and lower teeth. 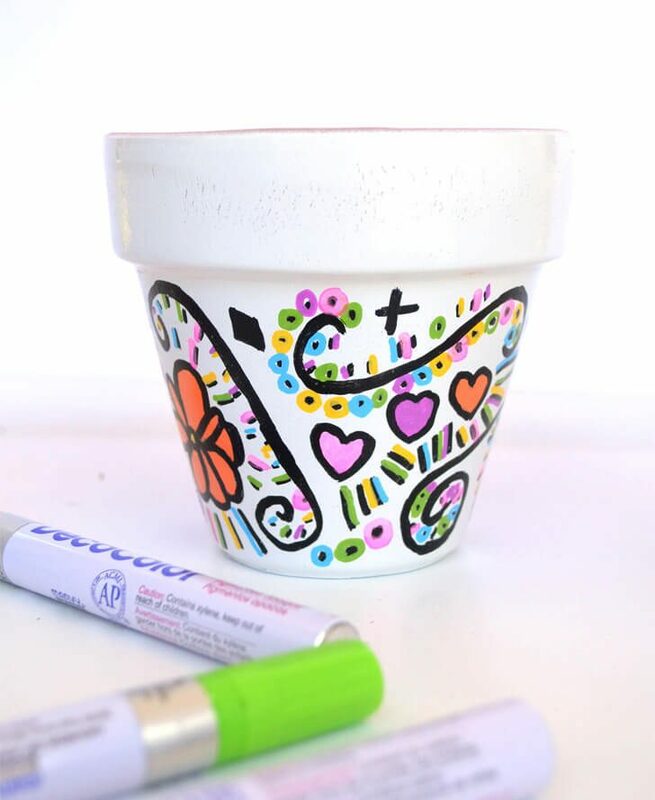 Once you have your face drawn use your colored markers to embellish. I found these really bright DecoArt paint markers and I’m totally digging them even though my pink didn’t work. 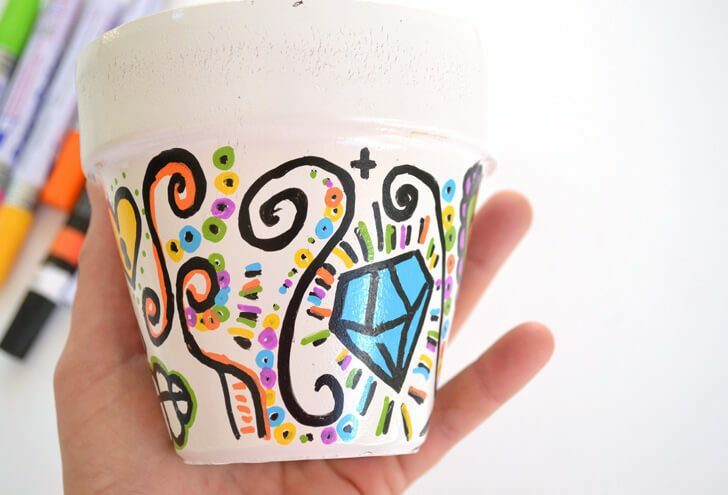 You’ll continue around the pot with marks and designs you can also embellish with color. Common themes include hearts, diamonds, keyholes, crosses and plus signs. Feel free to get creative and fill the space as much as you can. 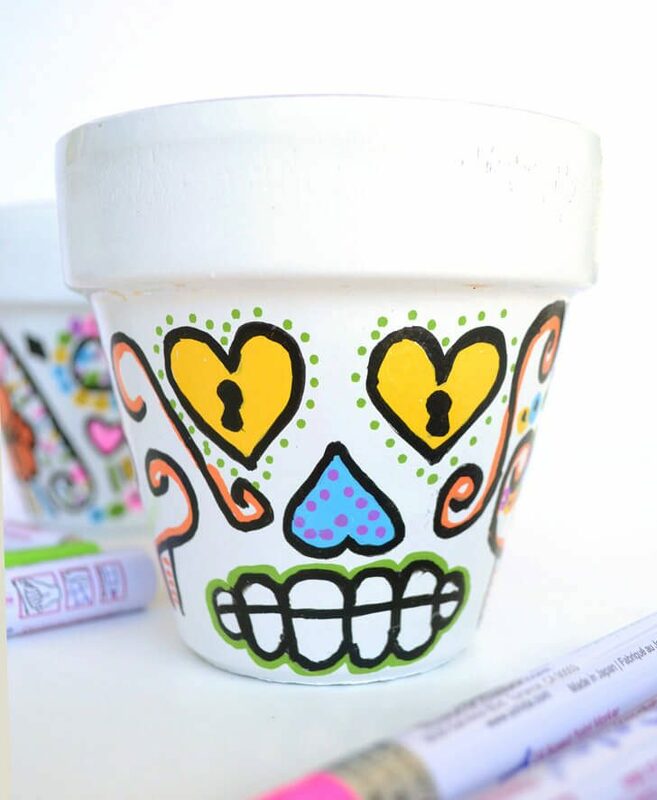 Continue for your other pots until you’ve got all sorts of bright and fun sugar skull goodness! 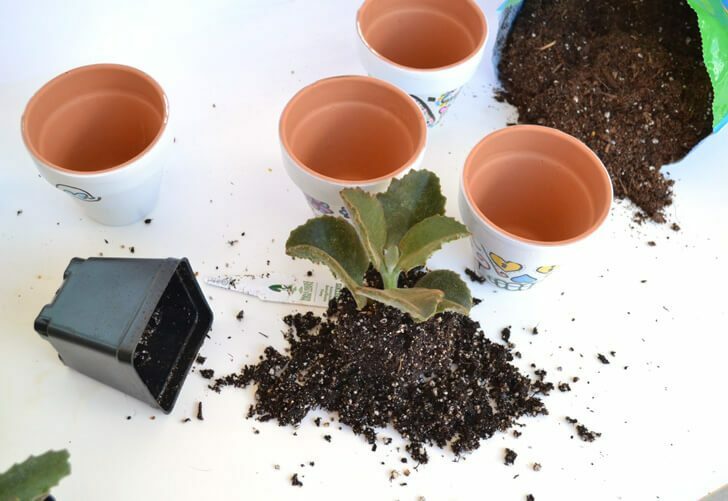 Depending on the markers you choose to work with you may be able to immediately start planting your succulents or you may have to wait a bit for dry time. Be sure to follow the package directions for your brand of paint marker. Bust out the potting soil and start planting your succulents. I have found that I prefer Miracle Grow Moisture Control because it helps where I’m bad about watering too much or too little. 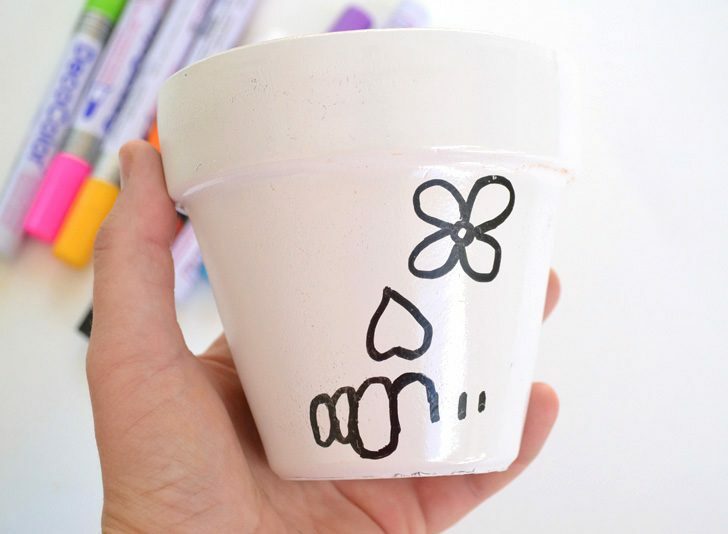 Once you’ve potted your succulents be sure to give them some water so just after to help them out. What do you think? 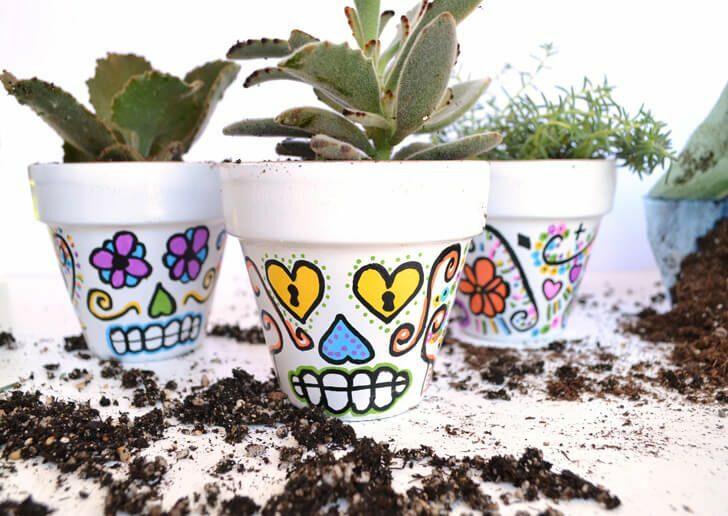 Are these sugar skull flower pots just the cutest? It seems I will need to make a few more for my sister because my Momma loved these so much that they are currently living on her mantle :) I like them so much I might make a few for myself, too!